70 Kms. from Airport, 35 Kms. from Railway Station. 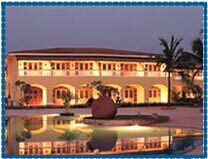 The Lalit Golf & Spa Resort Goa is situated on the Raj Baga beach and is located in South Goa. The Lalit Golf & Spa Resort Goa, formerly known as InterContinental The Lalit Goa Resort, is one of the most beautiful piece of architectural marvel in Goa. Hotel is inspired by the ancient Baroque-Portuguese style of architecture and is cradled by the slopes of the majestic Sahayadri range, the sprawling resort offer its guests an island of peace with formally landscaped gardens that overlook a virginal beachfront, and is a perfect example of the beauty of Goa. Hotel is spread well over 86 acres of land and is situated between the rivers and the ocean. Also The Lalit Golf & Spa Resort Goa offers its guests 880-meter long exclusive beachfront, giving the resort a unique advantage of both seawater & fresh water recreational opportunities. Heavily inspired by the Portuguese architectural style the hotel offers its guests with 255 spacious rooms and suites. 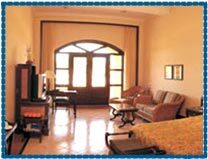 All the rooms and the suites in the hotel are well decorated to provide the best of luxuries to the guests. Hotel offers both smoking and non smoking rooms that can be chosen according to the taste of the guests. All the rooms in the hotel are well serviced by the hotel staff that have been specifically trained to provide the guests with the best possible service to its guests. 24 hours, Laundry and Valet, Business Centre, Beauty and Barber Salon, Ayurvedic Massage, Car Rental, Travel desk, Television with cable channels, Currency Exchange, Shopping Arcade, Safe Deposit lockers, Mini Bar, Tea Coffee making facility, Doctor on Call, Supervised kids corner, TV, Ceiling Fan, Coffee Maker, Dataport on Phone, Free Morning Newspaper Delivered to Room, Hairdryer, Voice Mail, All Guest Rooms Air Conditioned, Internet Access Mini Bar, Private Bath, Private Shower, Remote Control TV, Rollaway Bed/Cot, Safe, Satellite TV, Scale Separate Hanging Closet, Tea Maker, Two-Line Phone, Work Desk w/ Lamp, Newsstand, On-site Guest Laundry Facilities (washer/dryer), Porter/Bellman, Safety Deposit Box, Secretarial Services, Shoe Shine, Turndown Service Wake Up Calls, All News Cable Channel Bathrobe & Bathroom Amenities, Bathroom Telephone.